Bay Khudi is a tale of Fiza who shifted to her aunt�s house along with her mother after her father�s death. Saad�s mother loves Fiza as her own daughter. Fiza is happy because of Saad who�s her cousinand best friend, however Saad has feelings for Fiza.Fiza luckily gets engaged to Asher who she loves and doesn�t realize what Saad feels for her. 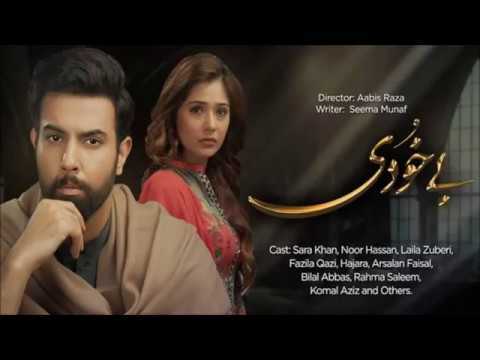 Saadcouldn�t accept the reality that Fiza is not his anymore and that�s where his love for her turns into obsession.Writer: Seema MunafDirector: Aabis RazaCast :Sara KhanNoor HassanLaila ZuberiFazila QaziTiming:Watch �Bay Khudi� Every Thursday at 9:00 pm only on ARY Digital.